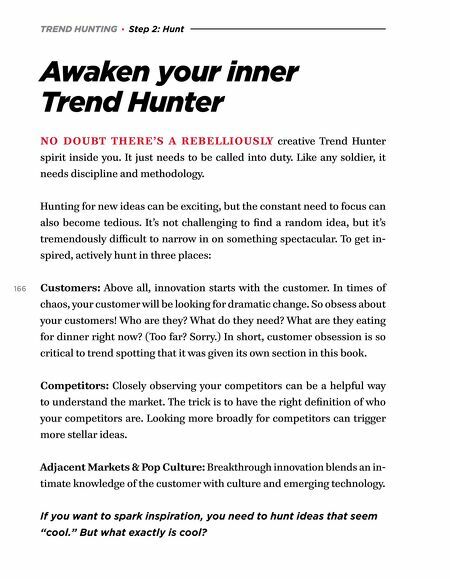 TREND HUNTING · Step 2: Hunt Awaken your inner Trend Hunter NO DOUBT THERE'S A REBELLIOUSLY creative Trend Hunter spirit inside you. It just needs to be called into duty. Like any soldier, it needs discipline and methodology. Hunting for new ideas can be exciting, but the constant need to focus can also become tedious. It's not challenging to find a random idea, but it's tremendously difficult to narrow in on something spectacular. To get in- spired, actively hunt in three places: 166 Customers: Above all, innovation starts with the customer. In times of chaos, your customer will be looking for dramatic change. So obsess about your customers! Who are they? What do they need? What are they eating for dinner right now? (Too far? Sorry.) In short, customer obsession is so critical to trend spotting that it was given its own section in this book. Competitors: Closely observing your competitors can be a helpful way to understand the market. The trick is to have the right definition of who your competitors are. Looking more broadly for competitors can trigger more stellar ideas. 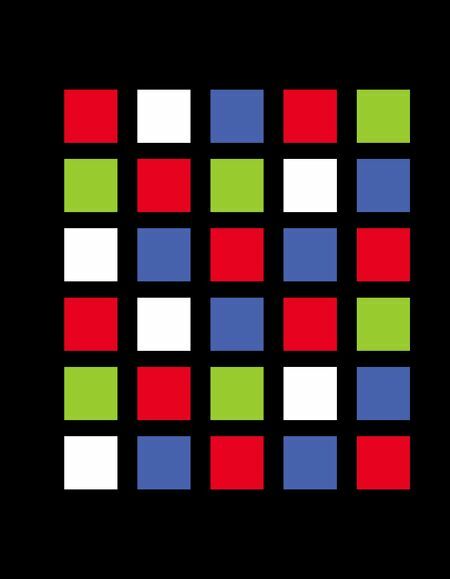 Adjacent Markets & Pop Culture: Breakthrough innovation blends an in- timate knowledge of the customer with culture and emerging technology. If you want to spark inspiration, you need to hunt ideas that seem "cool." But what exactly is cool?
. . . but not always. 20,679 Physicians say" Luckies are less irritating"
Specifically what are you trying to DO? "The right questions don't change as often as the answers do"
Don't ask, "Do you like it?" Ask, "What's wrong with it?" If you want to be remembered, invoke an emotional connection . . .
. . . but does an emotional connection matter if it works just a little biton everyone? Most importantly,cool is viral . . .